These quick and easy wraps are packed full of flavour and ready in just 30 minutes. Make a few extra for an on-the-go lunch the next day. Heat the oil in a large non-stick frying pan over a medium heat and fry the onion and garlic for 5 minutes until softened. Add the rice and chilli powder and stir-fry over a medium heat for 2-3 minutes. Meanwhile, heat a cast-iron griddle pan over a high heat. Add the chicken and cook for 3-4 minutes, turning once until the chicken is seared and cook through. Add the peppers to the pan after 2 minutes and cook until soft. Cut the cooked chicken into thin strips and stir into the rice mixture with the peppers. Season to taste with salt and freshly ground black pepper. Warm the tortillas as directed on the packaging. Place a tortilla on a chopping board and spread with 1 tbsp of the salsa. Top with a quarter of the chicken and rice mixture. Fold in the sides towards the centre then roll up tightly to completely enclose the filling. Repeat with the remaining ingredients to make four burritos in total. Serve the burritos halved, with lime wedges. 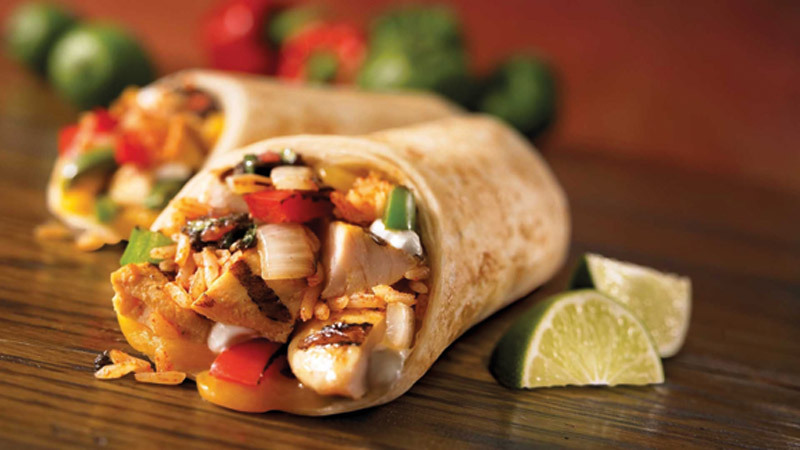 Make it quick: Use a 250g pouch microwave Mexican style rice instead of cooked long grain rice. Add to the pan with 2 tbsp water and stir-fry until piping hot.